. 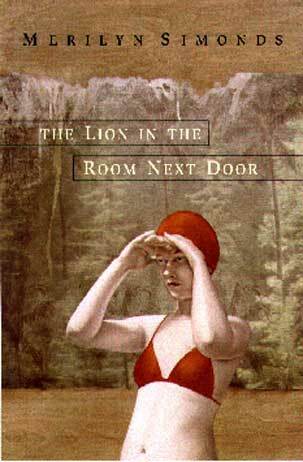 The Lion in the Room Next Door | Excerpt . I remember only the end. I don’t know when it began: the low rumble like an earthquake’s first tremor, felt through the soles of the feet. No one heard it but me. I lie in my bed in the darkened hotel room, so far away from home, and listen to this sound of the night. Closer it rolls, then away, like thunder, or the changes in our lives. My three sisters, in their beds next to mine, are asleep; in this room and in the hall outside, silence. Then the rumble moves through the wall by my head and I lie very still between the sheets. I think: when it comes too close, I will wake my mother and father, who sleep in the room next to ours, on the other side. But the tremor recedes like the tide, my fear ebbs, too, and I sleep. Because I always woke early, I became expert at slipping unnoticed from sleeping rooms. I pinch the lock and ease it one degree at a time toward the vertical, holding it back at the very last second so as to dull the heavy sound that backs the bolt finally into its slot in the door. This morning, I execute the first phase perfectly; the lock retracts as smoothly and silently as a turtle drawing in its head. I grasp the doorknob with both my fists and turn it ever so slowly, leaning into the work until that wedge of metal is fully retracted, too. Then, pressing against the wood to guard against my own eagerness, I pull open the door, holding my breath and listening for the first cry of the hinge that might give me away. A sister turns in her sleep. I stop. She flings her arm out from the bedclothes, and under cover of the rustling sheets, I take my chance and widen the gap the rest of the way. Slipping into the hall, I reverse my pantomime, pulling the door to, the knob twisted tight, then released, the catch sliding soundlessly into the frame. I pause for several minutes. No one stirs. The row of doors that open onto the third-floor hallway, like eyelids, stay tightly closed. The indigo carpet beckons beneath my feet. I learned how to spy in those silent golden dawns: I made the Hotel Terminus my own. I pad quietly along its halls, taking the stairs from floor to floor. Fearless in my solitude, I listen outside strangers’ doors. Now and then, I see a maid. I smile when she says, –Bon dia, senorita, catching her words between my lips and when she is gone, rolling them on my tongue, foreign yet familiar; oddly, faintly sweet, like the dew from an exotic fruit. Mostly, I prowl near Room 32, the room next to ours that rumbles through the hot, still nights. But all I hear is my own short, quickened breath in my ear.